Check for available clinical trials. Allopurinol 300 mg a day PO can be considered for those with a high disease burden. Dose reduction is needed if there is renal impairment or if the patient is >70. There is no specific age cut-off for autologous stem cell transplantation but most clinical trials showing benefit have excluded patients over the age of 65 years. Given a satisfactory performance status, auto SCT may still be considered on a case by case basis between the ages of 65-70 years. Patients who are eligible for autologous stem cell transplantation (auto SCT) should be offered induction therapy with agents that do not inhibit subsequent stem cell harvesting. Bortezomib combined with cyclophosphamide and dexamethasone is the current first line regimen of choice. Alternatives include thalidomide combined with cyclophosphamide and dexamethasone. Other regimens include Cy-Dex alone, Dex alone, VAD or Z-Dex. A referral to the transplant committee should be made early in the treatment course to aid with scheduling of stem cell harvest and transplantation. Current BCSH Guidelines (2014) recommend harvesting sufficient stem cells to support 2 high dose procedures in patients with good performance status. Induction therapy should continue until maximal myeloma response is achieved and “plateau” is demonstrated. Although delayed transplantation is possible, most patients proceed to autologous stem cell transplantation (ASCT) as the next course of treatment. There is evidence to suggest that a second ASCT improves progression free survival when used to consolidate salvage chemotherapy in relapsed disease, particularly if the first progression-free interval was over 1 year (Mikhael et al, 2004; Cook et al, 2014). BCSH Guidelines state: “A second ASCT should be strongly considered in patients with >12-18 months response to the first ASCT although its impact on overall survival is currently unclear”. The issue remains slightly controversial and patients should be referred to the Transplant committee for discussion. Following autologous transplantation, consideration should be given to “consolidation therapy” using a combination of bortezomib, thalidomide and dexamethasone for 4 cycles. Renal failure is not an absolute contraindication to transplantation and each case should be assessed individually. BCSH Guidelines recommend that HDT and ASCT may be considered for patients with severe renal impairment (creatinine clearance / GFR <30 mL/min) but the dose of melphalan should be reduced to a maximum of 140 mg/m2 and the procedure should only be carried out in a centre with special expertise and specialist nephrology support. Induction therapy should continue until maximal myeloma response is achieved and “plateau” is demonstrated. Maintenance therapy is not currently recommended. Thalidomide is associated with an increase in venous thrombo-embolism (VTE). Thrombo-prophylaxis with aspirin, LMWH or warfarin is recommended depending on risk. The BCSH Guidelines on supportive care in myeloma (2011) recommend risk stratification to determine optimal Thromboprophylaxis using a scoring system developed by Palumbo et al (2008). See risk stratification table. Peripheral sensory neuropathy is a major complication with thalidomide and is mostly irreversible. Consider dose reduction of thalidomide if neuropathy develops or change to another agent. Consider other causes of neuropathy (diabetes (steroids), B12, folate, thiamine, alcohol, HIV, rheumatoid, sarcoid, vasculitis, POEMS). Thalidomide is a class B Controlled Drug (Prohibited Substance) under the Misuse of Drugs Act and Regulations. See Thalidomide Data Sheets on Medsafe. Each doctor requires their own one-time permit number to prescribe from the Celgene "i-access program". Complete the i-access Prescriber Registration Form [Em link to form] and send it away to receive your ”Doctor-PIN”. Give the patient the Thalidomide patient brochure to read. Complete the i-access patient consent form. This is two pages long. The first page must be completed by the prescriber but also signed by the patient. The second page should be completed by the patient, initialling only next to the boxes that are relevant to them. Fax the pages to 0800 444 259. A patient unique PIN number (U-PIN) will be faxed back. Tick and fax away the PHARMAC special authority number request or, even better, apply online. You will receive a PCTX number for the patient. Write on a standard drug prescription pad, include the patient U-PIN, the PCTX number from Pharmac, and your Doctor PIN. Then send the prescription to the pharmacy. You can now prescribe 3 months of thalidomide on one script. The pharmacy will fill out and fax away an "i-access verification form" each time thalidomide is dispensed. The pharmacy will then receive a Celgene approval number back before each dispense. As the fax goes to Australia, this can only be done in New Zealand between the hours of 10.30 am and 4.30 pm NZ time. The prescription can go across to the pharmacy and this faxing process can occur without the patient. The patient can pick up the thalidomide later. For the first prescription you will have to let the pharmacy know if any female patients are "not of childbearing potential" and they will then keep that on record. Otherwise females will have to have a current negative pregnancy test before dispensing can occur. The dose of thalidomide is generally 100 mg PO daily, taken at night. The capsule sizes are 50 and 100 mg.
Major side effects include somnolence, constipation, peripheral neuropathy, skin rashes, fatigue, weakness and postural hypotension. For further details, see Thalidomide Flowchart for Prescribing. Lenalidomide can now be obtained for compassionate use beyond 3rd line treatment. The patient must first be registered on the i-access programme. The NZ Revlimid® 4Plus Application Form must then be completed and returned to Celgene via fax +61 3 9539 5566 or email to accessprogramsanz@celgene.com. Lenalidomide is approved for use as second or third line therapy in myeloma and is now funded by PHARMAC. Special authority for subsidy can be obtained for treatment of relapsed / refractory myeloma with progressive disease, either as third line treatment or as second line in patients who have experienced severe (grade ≥3), dose-limiting, peripheral neuropathy with bortezomib / thalidomide that precludes further treatment with either of these agents. The process of application for Lenalidomide is the same as for thalidomide and is detailed in the previous section. Access may also be obtained through current clinical trials. Note that lenalidomide is also associated with an increased risk of VTE. 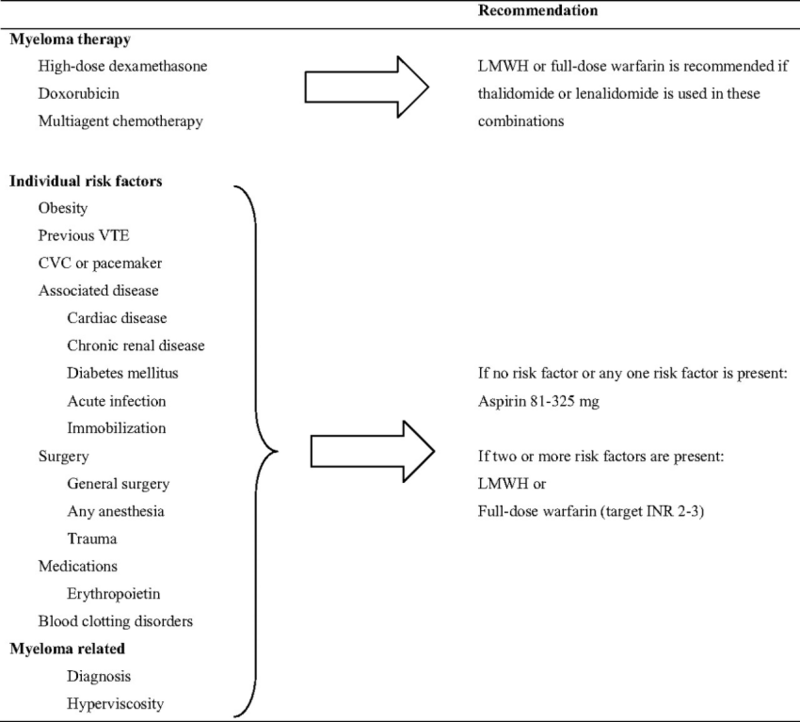 Aspirin, LMWH and therapeutic dose warfarin (target INR 2-3) can be used for Thromboprophylaxis with choice of agent determined by risk stratification (Palumbo et al, 2008). See risk stratification table. A patient information brochure is available for lenalidomide. Lenalidomide 25 mg PO OD d1-21 of a 28 day cycle. Plus dexamethasone 40 mg PO once weekly. Dose reduction is indicated in the case of myelosuppression and renal impairment. Guidance on dose adjustment is shown in the tables below. Dose adjustments, as summarised below, are recommended to manage grade 3 or 4 neutropenia or thrombocytopenia, or other grade 3 or 4 toxicity judged to be related to lenalidomide. Resume lenalidomide at next lower dose level (Dose Level –2 or –3) once daily. Do not dose below 5 mg once daily. In case of neutropenia, the physician should consider the use of growth factors in patient management. 5 mg once daily. On dialysis days, the dose should be administered following dialysis. See the BCSH Guidelines (2014). The risk of herpes zoster is increased. Prophylactic acyclovir should be used. A special authority number is required. Apply online or use this form. A prescription sheet for Bortezomib is available. Major side effects include peripheral neuropathy (often painful but mostly reversible) and thrombocytopenia. Dose modification can be used for side effects, reducing doses of 1.5 mg/m2, 1.3 mg/m2, 1.0 mg/m2 or 0.7 mg/m2. Side effects are decreased by administering bortezomib once per week. This schedule is non-inferior to twice a week dosing and results in equivalent dose delivery. Side effects are also decreased by delivering bortezomib subcutaneously rather than IV. Again, this has non-inferior efficacy and results in equivalent exposure to bortezomib. Dose adjustments for bortezomib-related peripheral neuropathy are made according to guidelines from the APEX trial. See Richardson, P. G., et al. (2009): "Reversibility of symptomatic peripheral neuropathy with bortezomib in the phase III APEX trial in relapsed multiple myeloma: impact of a dose-modification guideline." Br J Haematol 144(6): 895-903. This is the current first line standard induction regimen and allows subsequent stem cell mobilisation. A prescription sheet is available. Bortezomib has established efficacy when given once weekly. Subcutaneous administration of bortezomib is equivalent to IV but gives fewer side effects. The risk of herpes zoster is increased with bortezomib. Use prophylactic acyclovir. *Cyclophosphamide dose can be modified if cytopenias are induced. Round to nearest 50 mg.
#Bortezomib dose can be modified for side effects (e.g., neuropathy, thrombocytopenia). Click here for pre-printed prescriptions and patient instructions. Thalidomide 100 mg daily PO. Cyclophosphamide 300 mg/m2 PO once per week. Dexamethasone 40 mg PO once per week. Consider thromboprophylaxis with aspirin, LMWH or warfarin. C-Thal-Dex is continued until maximal response. At this point cyclophosphamide and dexamethasone can be stopped. Thalidomide can either be continued until disease progression or can be stopped and re-started when disease progression is noted. See the Thalidomide section for prescribing instructions. Other cyclophosphamide regimens include: Cyclophosphamide 1 g/m2 IV every 3 weeks; Weekly cyclo IV 300 mg/m2; Daily cyclo orally 50 mg. The VISTA trial used VMP as induction therapy. The following schedule modifies VISTA for once weekly and subcut bortezomib. Click here for the prescription chart. Check CBCD on day +14 of first course or following an increase in dose. Confirm mild myelosuppression (neuts <1.0 x 109/L or platelets < 100 x 109/L). If myeloma not responding or no myelosuppression consider escalating melphalan dose in approximately 20% increments. Repeat every 6 weeks until plateau phase (stable paraprotein over a 3 month period in an asymptomatic patient) and then stop therapy and observe progress. Re-treat following evidence of disease progression. Reduce melphalan dose to 5 mg/m2 if the serum creatinine is >0.2 mmol/L. Consider other drugs if creatinine is >0.3 mmol/L. Melphalan not recommended for patients undergoing dialysis. Consider thromboprophylaxis when using thalidomide – aspirin, LMWH or warfarin. Repeat cycle at 4-6 weeks when neutrophils > 1.0 x 109/L and platelets > 75 x 109/L. If patients have not reached these levels within six weeks of the start of the last block of therapy, consider second line with different therapy such as cyclophosphamide, dexamethasone and thalidomide. MPT is continued until maximal response. At this point melphalan and prednisone can be stopped. Thalidomide can either be continued until disease progression or can be stopped and re-started when disease progression is noted. As for C-Thal-Dex but omit the thalidomide. As for MPT but omit the thalidomide. "Bolus VAD" does not require a central line. VAD is associated with a risk of venous thomboembolism. Cycles 1, 3 and 5 are 28 days; cycles 2, 4, 6 are 21 days. Total IV drugs can be mixed. 3-6 courses are administered until maximum response is obtained. Give prophylactic therapy with nystatin oral suspension 1 mL QDS, co-trimoxazole 480 mg daily, omeprazole 40 mg nocte. Note: A copy of the prescription sheet for bolus VAD is available. Etoposide 25 mg PO daily could give response in otherwise refractory myeloma. Continue until maximal response. Recycle at 28 days until plateau or progression. Other regimens include dexamethasone 40 mg PO once per week and lower dose 20 mg once per week. Z-Dex is an oral regimen. It is expensive when compared to other oral regimens but useful for some patients. * The total dose of idarubicin is 40 mg/m2 over 4 days. Because the drug is available only as 5 mg tablets, it may be necessary to give slightly different doses on one or more of the four days. ** For the first course only. Days 1-4 only for second and subsequent courses. Note: Please ensure pharmacy has 2 weeks notice (where possible) to ensure that the drug is available.